It's tempting to see Real Magic as a metaphor for Forced Entertainment's later career: a minimum of content, relentlessly repeated, carried by the magnetic performances but offering diminishing returns with each iteration. 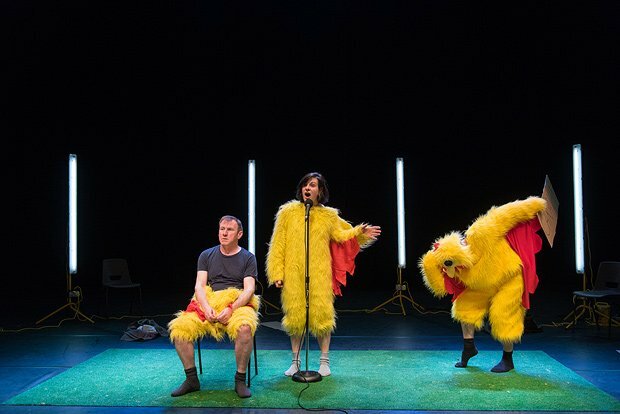 Equally, there's an admirable uncompromising stubbornness in the serving of such niche performance to the Edinburgh International Festival, with its rejection of anything predictable theatrical and a willingness to test an audience's endurance. The set-up is simple: three actors attempt to do a mind reading trick, constantly failing and going through the same process – switching roles each time – for 90 minutes. Now and again, they break for a dance in chicken costumes. There's no resolution, the actors take turns as victim and tormentor, the minds are never read and both audience and cast are visibly frustrated. It could be a parody of contemporary avant-garde theatre. It could be a comment on the futility of life, or perhaps the absence of real magic. It could be a company running on empty, hoping that profundity might be found in their blank, post-modern disavowal of meaning. It could be a company at the height of their powers, mocking the need for narrative. The set-up is simple: three actors attempt to do a mind reading trick, constantly failing and going through the same process – switching roles each time – for ninety minutes. Now and again, they break for a dance in chicken costumes. There's no resolution, the actors take turns as victim and tormentor, the minds are never read and both audience and cast are visibly frustrated. Leaving the question hanging, and replacing solutions with repetitions is the point.